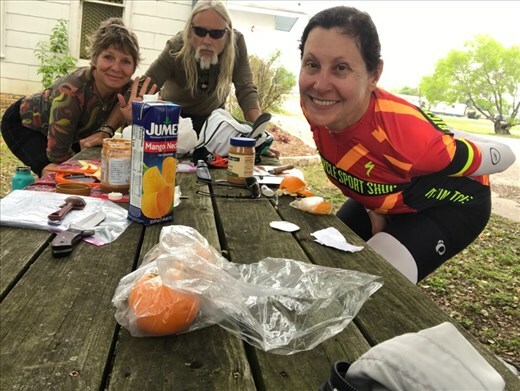 Well, James and I decided to head south to the Gulf Coast and Margie continued on the Adventure Cycling Rout east and we parted ways after lunching together in Cedar Creek. I liked the “gang of three”, but we had different ideas, heading in the same direction. 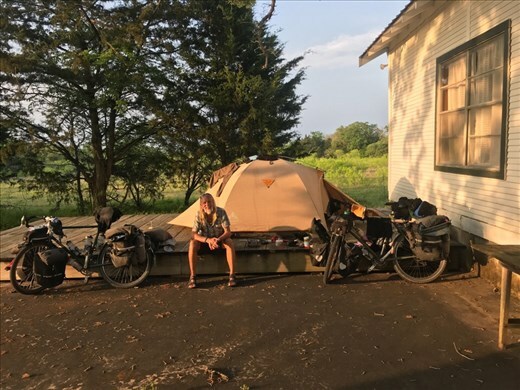 We had no clue - as usual - where we were going to sleep that night and after riding road 304 south (which looked like a small enough road) with no shoulder but lots of trucks and traffic, we nodded at each other (called: none verbal communication) in agreement to pull over at the community center in String Prairie. We had already filled up with water/food and goodies at a friendly local store prior to this discovery for our shelter for the night. A storm was brewing according to the weather forecast, but there was still no sign of it. The CC building with a wooden deck and a lawn in the back was a welcome protection. We sat around for a while to see if there would be some action that evening, since it was Friday. While we sat up the tent, a photo shoot group came by for Highschool graduation pictures. What I noticed here in TX, is, that people don’t seem to be scared of strangers. Their first reaction is a smiling open face...no hesitation! Who would have thought? This little group was so curious - one of them belonging to the CC and said she’ll let the rest of the member know via text, that we are spending the night here next to the building outside in our tent. She was pretty sure, that it wouldn’t be a problem. The promised storm arrived in the night with thunder/lighting and LOTS of rain...continuing in the morning. 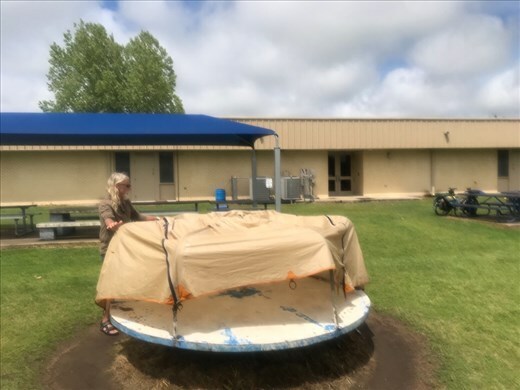 When the day broke, we seeked shelter under a roofed picnic table area belonging to the CC. I also discovered that the actual CC building doors were open and I took the liberty to charge my phone, hang my damp thermal rest over some chairs...maybe use the stove and or the microwave ...also, there was a heater ...I could dry some of my damp belongings! James didn’t think this was a good idea.. It poured, it dumped and we felt so lucky to have a roofed picnic area....eating breakfast leisurely, when a car pulled up with a semi unfriendly, elderly couple inquiring our reasons for being here. The vice president of the CC was not impressed when we told them about our world tour and the hostile smile of the woman next to him was equally unconvincing that we were welcome. We had a business card from the woman the night before who gave us permission ...nothing changed his tune. Oh, well, I didn’t think much of it...we met so many friendly people, one or two hostile ones couldn’t really “rain on my parade” this morning. Soon after, a shiny truck pulled up, parked near the building..nothing more.........then the sheriff. They obviously had a “date” and walked up to our picnic table together....we are in trouble, no doubt! “...but we had permission”, as we handed him the business card from the woman the night before. “You do not have permission, I am the president of the CC here in String Prairie and you don’t have permission” said the angry, cow-boyish looking ...actually a bit handsome, middle aged man. Now, the sheriff/woman was hip! Her hair was hip, her attitude and there was that open/friendly face I had been missing from Mr. Vice-and Mr. President. The latter one chilled a bit, after we did the question and answer game and especially after he checked out the building and there was no trace of us ever having entered it, just like we promised: “no, we never stept into the building!” I felt like smooching James right then right there: You were so right!